Gemini Stainless Steel Fabricated Letters are perfect for retail or architectural letters where high-end quality fabrication is an absolute must. 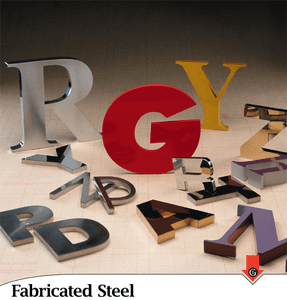 Available in a wide variety of thicknesses, colors and finishes, Gemini Fabricated Letters can include mirror-polished faces and edges where cast metal letters do not. Titanium coating is also available to provide the look of brass at a fraction of the cost. With lead-free solder and crisp 90º edges, Gemini Fabricated Letters offer the technical specifications required of such letters with the utmost in beauty and quality.